Back in the early 1990s, I really kick started my education in horror. 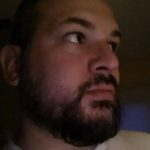 I grew up in the slasher era, A Nightmare on Elm Street, Friday the 13th and Halloween. That was just the beginning, in the early part of the 1990s I started in on some of the more recent classics. I say recent I mean other films from the 1980s I may have missed and the Hammer Horror series. One of those good ole nights of staying up late watching the Friday Night at the movies film on channel 11, they showed the first three Amityville Horror movies. I set the VCR up to record, sat back with my remote so I could pause during commercials and watched all three movies, I remember it well. Amityville scared the hell out of me and I was up until nearly 5 am. After Amityville 3D was over, I watched Amityville again, since I recorded it. It was great, also side note, I had previously seen Amityville 3D without knowing what it was. The movie itself is a great horror film. It has the trappings of an average haunted house story, but it has the added effect of being “based on a true story.” It may not be 100% accurate, but there are many chilling scenes in the film. James Brolin is fantastic as George Lutz, he is very believable in the role. We really see the character break down over the course of the movie as the house takes him. The rest of the cast, is good and works well, I love the little girl who makes friends with Jodie, who seems to be an imaginary friend. The cast itself works well to make you believe this is some all American family going through the terror of a haunting. There are many scenes that bring good scares, the walls bleed, the flies with the priest and the disembodied voice that screams “GET OUT!” Then we get to an employee of George Lutz, he brings his wife over and she starts tearing up the basement and finds the hidden room and she goes a little nuts. All great stuff. There was a remake in 2005, starring Ryan Reynolds. I was pretty excited about the film, but it was terrible. There are somethings about it that almost redeem the movie, but overall I am not a fan. I did not like how they focused on the pilgrim, Ketchum and Kill em. It just did not work for me. One thing I remember, George is cutting fire wood and he has the oldest brother hold the logs as he chops the wood with an ax. 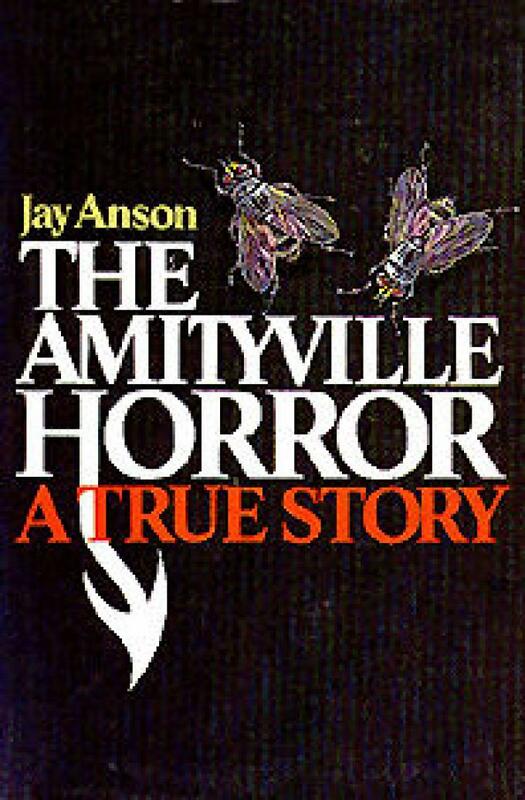 I do like a few of the sequel, Amityville 2: the Possession works as a prequel/sequel as it seems to be about the DeFeo family and the possible events leading to their murder by the oldest son Ronnie. The rest of the sequels are forgettable. 3D has Lauri Laughlin from Full House, part 4 has Patty Duke and the fifth and sixth movies are very strange. The leave the house and any item from the Amityville house is possessed, like Amityville 1992 – it’s about time. 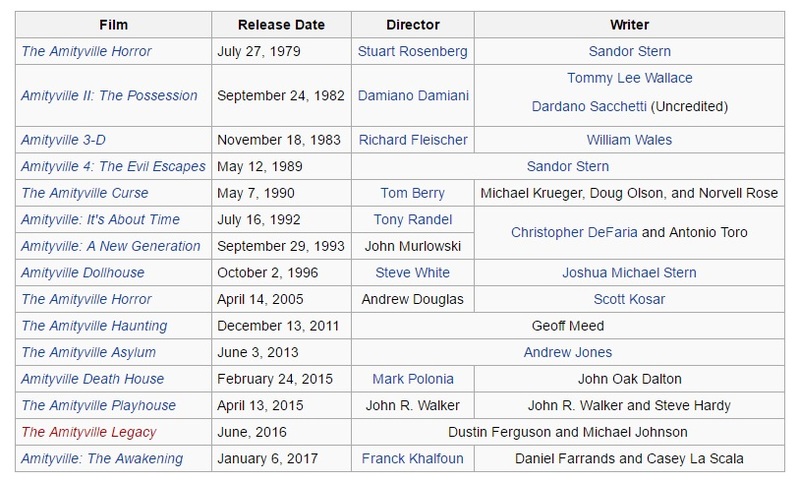 Here is a list of all Amityville films, it is crazy how many have been made. I have only seen the first 7 up through “A New Generation”. I have seen the Amityville Haunting and it is so low budget it is laughable, it is kinda a found footage type movie. Amityville the Awakening looks promising. I wonder if anything will ever come of a possible sequel to the Conjuring, it is kind of set up with Ed and Lorraine Warren, who investigated 112 Ocean Ave. But the sequel only talks about the Amityville case. Oh and the house, which has since movie to the address of 108 Ocean Ave is now up for sale, just under 1 million dollars. Here is the trailer for the long awaiting Amityville the Awakening. This movie has been pushed back so many times. It looks decent from the trailer.